Looking to cut your grocery bill in half, but don't have the time to sort though thousands of coupons? MyGroceryDeals.com allows you to customize your coupon shopping, so that you get deals on your favorite products at your nearest supermarket. The site includes deals at 275 retail chains across the country, including 18 in the New York City area. We're talking Whole Foods, D'Agostino's, Food Emporium, CVS, and many other major supermarket chains. According to the website's co-founder and Executive Vice President John Scott, "people are saving thirty to fifty percent" on their grocery bills. The site is free to use. Once you sign up, you enter your zipcode and a drop down menu lists the retail chains. Select your local store, and you can start shopping. The site even tallies up the amount of money you're saving. MyGroceryDeals.com launched about a year ago but Scott says the company "could have never foreseen the downturn of the economy and obviously it's an unfortunate turn of events but I think our site provides a great opportunity for consumers to save money." MyGroceryDeals.com customizes coupons for you -- for free. Just enter a zipcode and pick a store near you. 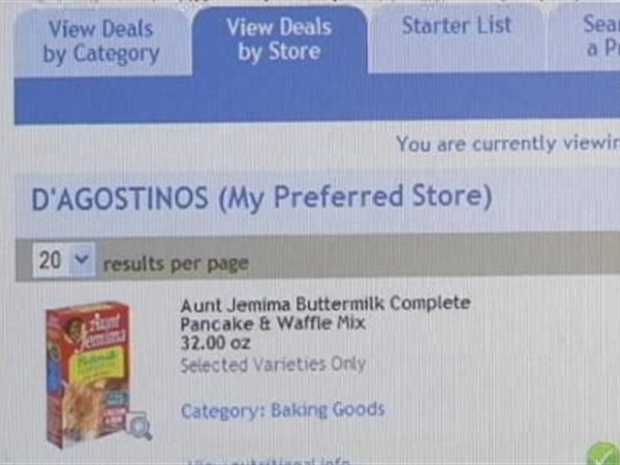 Although the site is now free, there are plans to add a service that would alert members when their favorite items come on sale, called "Deals Plus." And Scott adds that if you don't see your nearest store included on the site, just send them a note and request it be added. They're adding retailers all the time.